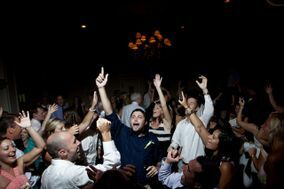 I am a venue coordinator who recommends DJ Adam to all my clients ever since we worked together on a wedding reception. He is a wonderful MC and actually has people skills unlike many of the DJs I deal with! Plays great music and is an all around nice guy, too. Adam came from a personal referral and was the only DJ I talked to prior to our wedding. I know now we didn't need to talk to anyone else as he was the perfect choice for our wedding. The dance floor was full - the entire reception! His song transitions and choices catered to both the older and younger crowd attending the wedding. While we gave him some ''must play' hits, he managed the flow and vibe of the night with his creative vision. Aside from the music, Adam really acted as our MC in introducing our wedding party, making some important announces and guiding the night's timeline. He is very friendly, approachable and a happy guy to have behind the speakers. We so highly recommend Adam and our only regret is that the reception couldn't have gone all night to enjoy more of the party! I don't know how anyone gets married without Adam! He single-handedly made our wedding truly epic. He helped us to build our playlists from the ceremony through our post party! He was responsive, available, positive, excited, knowledgable and professional. We had some difficult requests, including changing the tempo of our first dance, and he came through with a perfect song that we'll remember forever. Our guests were on the dance floor from dinner until late night, and I mean every single guest! Our friends and family told us that they've never danced so much at a wedding and didn't want the night to end! For us, music was the most important part of the wedding and Adam was the best decision we made! He made all of our dreams come true and far exceeded expectations. Now, we just want another reason to hire him! Could not have asked for a better dj. Was so great with when to play songs, the dance floor was crazy all night. I would highly recommend Adam for any event. Extremely professional and timely. We hired him for our wedding in June. 10 out of 10 and will recommend him to all my friends. Booking Adam was one of the best decisions we made. He was professional, organized, flexible, and determined to exceed our expectations from the moment we met. In response to any idea I presented, Adam would confidently reassure me he would get it done exactly how we envisioned it. And he did. One of my favorite memories from our wedding is the fact that NO ONE was sitting down ... literally every person at our 135-person wedding was on the dance floor. It was so fun to see our guests from all generations and all over the world all enjoying every song all night long. The energy Adam helped create in the room was electric. I highly recommend Adam Smith for any event that you want to create a fun, memorable, special day. Adam provided exceptional service for my daughter's wedding. He went to great lengths to be at the planning sessions, venue walk through, coordinating sound with/for our ceremony musicians, family favorites for an elegant Cocktail Hour to Dinner and getting everyone (including 86 year old gpa to aunt with a hip replacement last month) dancing the entire night. Adam really got to know our style and did an amazing job creating fun and energy with through his music. Thanks, Kim! im so happy that everyone had such a great time. That dance floor was one for the ages! I am extremely happy that Adam Smith Music Services was available to DJ our wedding reception. From our initial phone call up through the wedding day, Adam was incredibly professional, knowledgeable, and friendly. Adam was always available and responsive by phone and email while working to plan our wedding reception. Adam accommodated our special song requests, special announcements, and created a dynamic playlist that kept our dance floor filled the entire night. Our gusts are still talking about how much fun they had, and are still raving about our amazing DJ. Booking Adam Smith Music Services was a great decision! Adam Smith Music Services was by far the best experience we've had with any DJ. They were extremely responsive and professional and also willing to work with us to make sure our wedding day was perfect. The variety of music was top notch and the DJ had the dance floor packed the entire night. Couldn't have picked a better DJ!! I can confidently say that Adam Smith made our night!!! Our friends and family were on the dance floor immediately after dinner ended and they did not leave. Prior to the wedding night-Adam went out of his way to plan the music and genres with us, provided helpful song recommendations, and even located a song I could not find. The attention Adam paid to detail was amazing, and so many of our guests raved about him after the wedding....I highly recommend this dj!!!! Thanks, Keri! It was great working with both of you.. the Mirrors encore was perfect and the NYC skyline was such a great backdrop! We told Adam we wanted our guests to be on the dance floor the whole night, and that is exactly what happened. He did a phenomenal job of getting the party started and keeping it going the entire time. We would highly recommend him! I want Adam Smith to DJ my life. Thanks, Tommy! It was an absolute pleasure working with you and the venue was absolutely gorgeous! Adam provided music for our wedding ceremony, cocktail hour and reception in October 2016. We had previously attended a wedding that Adam had worked and thought the music was fantastic, which is why we reached out to him. He did not disappoint! We had a great experience working with him from beginning to end. He was always responsive and willing to accommodate some last minute scheduling changes, which we really appreciatted. We had several wedding guests comment on how awesome the music was and how much fun they had dancing all night. I would highly recommend Adam to anyone looking for a wedding DJ. Thanks, Mahsa! It was great working with you!!! Adam Smith Music Services was amazing. I found Adam to be incredibly helpful and responsive. He had great planning tools and adapted easily to week and day-of changes. I'd highly recommend Adam Smith Music Services for any event! Thanks, Heather! It was such a pleasure working with you! Thanks, Joe! Great working with you and Joey!!! Adam did a great job. Our partygoers were dancing their butts off. And Adam very professionally stayed off the mike and helped keep the party organized. Great time! DJ Smitty Gritty was absolutely incredible and we truly could not have made a better decision hiring him for our big day! There is big difference between your typical DJ who plays great songs and hiring a DJ like Adam. He was attentive, energetic and has a real talent for knowing exactly what song to play next to keep the entire dance floor full. He respected our "must play" list however, added in his own perfect additions to tie it all together. Our guests did not want to leave the dance floor! Even the process leading up to the wedding blew us away. He coordinated phone/email consultations and answered any question we had, no matter how small. Most importantly, DJ Smitty Gritty was the kind of DJ who felt like part of the party; engaging with us and all our guests. He can guarantee an excellent party, full dance floor, and a night to remember for you and everyone else! We recently hired Adam to DJ our wedding reception. From the start we knew that we were working with someone who was knowledgeable, organized, and experienced. He took the time before our wedding to talk us through the entire day to ensure that the schedule of events, timing, and types of music were exactly what we were looking for. He helped us to ensure that we thought of everything beforehand that we needed to, and voluntarily got in touch with our wedding planner to ensure that everyone was on the same page. Adam gave us the flexibility to either give him a specific song list to be played, or to give him more freedom with songs and read the dance floor to keep the party going. We opted to give him more freedom with songs and could not have been happier with how the reception turned out. From the start, the dance floor was packed and people did not stop dancing until we had to close it all down. In the days after our wedding, we received rave reviews from anyone who was there about the atmosphere and how much fun the dancing was. We owe much of this to the fine job that Adam did. For anyone looking for a DJ for their wedding or event, you can feel comfortable and confident with the job that Adam will do for you! Smitty was great--not much else to say. His playlist kept people on the dance floor, he stuck to the "do not play," and was just all around professional and accommodating. We can't recommend Adam enough. From the very start he was attentive and detailed in getting a picture of how we wanted our wedding to go. He did a seamless job of integrating our unique musical tastes into our wedding, helping to make the whole event that much more personal for us and our guests. From the wedding party introductions and through dinner he stayed out of the way and kept the mood perfect with a playlist he built off our suggestions. Then once the dancing started he kept everyone on the floor and moving. He played all the great classic songs people like to dance to without any of the corny wedding favorites, and he held fast to the "do not play list." Your DJ is your "event manager" once the reception starts, and I couldn't ask for a better one than Adam. He was professional throughout the planning and the event, sensitive to the crowd, and really just made the whole experience enjoyable. Adam (Adam Smith Music Services) is the BEST DJ in Northen Virginia and here's why. He cares so much about the bride/groom experience and goes above and beyond to make your reception the party your friends and family will talk about weeks after your wedding. Thanks, Kate! You and Nick were amazing to work with and the view of the Potomac was breathtaking! Adam Smith is an outstanding DJ! We booked him for our wedding at Hotel Monaco in November 2015. Our first contact began with an initial phone consultation to go over our styles and wish list. He was professional and thorough in the questions he asked. He really helped us understand the timing of events at a wedding and what to expect from him. From the get go, he was prepared and we knew we'd made a great choice. The week of the wedding, we had our final consultation with him. He went over how he envisioned the flow of the music to go throughout the night from which genre made the most sense for cocktail hour/dinner to the songs we did not want played. We went step by step over our timeline and sequence of events from cocktail hour to the announcing of the bridal party through the last song. Adam really understood how to seamlessly string together all of the music to perfectly time it to the different parts of the night. He was armed with suggestions for entrance songs and last songs. On the day of the wedding everything was amazing. As a couple who did not have a day of wedding coordinator, we knew we could trust that Adam would keep the party going on time and keep things moving along - and he did just that! When it came time to move people from cocktail hour to the reception and gather the bridal party all together, he did an amazing job. Our entrance was fun and perfectly timed to the music. Once the dancing started after dinner, he kept the dance floor packed the entire night. The music had people never wanting to stop dancing. We had to have 3 last songs because the crowd kept demanding more! Overall – Adam Smith is professional, prepared, thorough and reliable. He has outstanding taste in music and really takes the time to understand your vision and put it to music. I'd highly recommend him! This DJ is top shelf...the professional youre looking for to handle your event. Respected the format and style/feel we were going for yet made some excellent suggestions that showed he was involved and wanted the event to be a success for us, not just a paycheck for him. Adam is the vendor you read/hear about...the complete package. I will use his services again and have already recommended him." "Adam did an amazing job on our wedding day! We used him for the entire night, ceremony, cocktail hour, and reception. The music flowed so well from one section to the next. Before the wedding it was very easy to communicate and figure out everything we needed. I didn't realize how many different parts had to come together for the planning process but Adam guided us through the whole process and had awesome ideas and suggestions that helped the night move smoothly during all the transition periods. Our reception was a blast and the dance floor was full the whole night just as we were hoping. I would recommend him to anyone!!" Adam did an amazing job with our wedding. The dance floor was full the entire night! From start to finish, Adam helped make the planning and coordinating an easy and enjoyable process. It was great working with Adam, and I’d highly recommend him to anyone! Everyone knows a DJ can make or break your wedding. For our wedding, Adam made it unforgettable. Before the wedding day, we had a couple phone conversations to go over the timeline and types of music we wanted for the wedding day. Adam's experience allowed him to guide us without being overbearing. For example, I had an idea for a last song that Adam said was good, but probably wouldn't be the right vibe for a last song. So we re-thought it and ended up with a last song that made many people (including myself) wonder, "is this dance floor going to collapse??" We really trusted Adam's taste so we let him make most of the music decisions, and he did not disappoint. Our dance floor was packed the entire wedding, and there were multiple guests who commented they had never seen such a busy dance floor. He is punctual, affordable, professional and the perfect mix of MC and DJ. I cannot say enough good things about Adam and would recommend him to anyone.